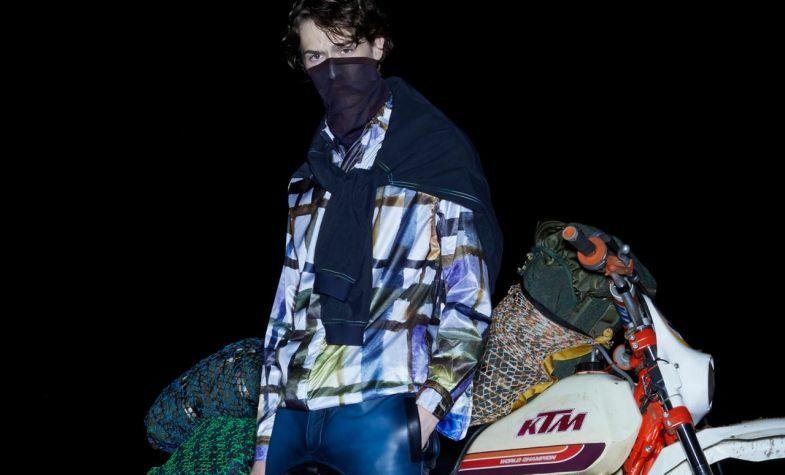 This season, the whole collection has been inspired by the famous Paris to Dakar motorcycle rally. The boys in our family have for some time had a private collection of motorbikes. My brother Vittorio loved bikes and now my son Francesco and nephews Giacomo and Marco all ride. 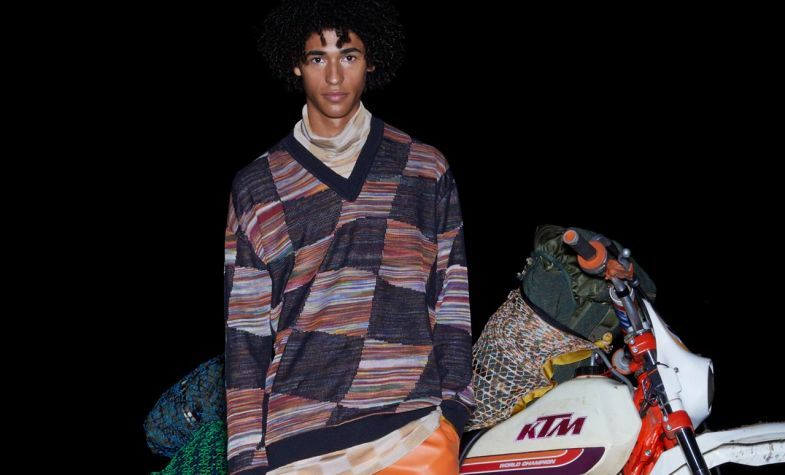 So it was a cool idea to think of this as a collection to dress a whole Missoni bike rally – in our head it was almost like thinking of a fantasy family rally taking place from Europe to Africa, from Paris to Dakar. So we started off with the idea of Paris – all the shapes here are much more clean, crisp, and there’s lots of leather – all very impeccable; and then the collection moves across continents to end up in Dakar, in Senegal, West Africa. 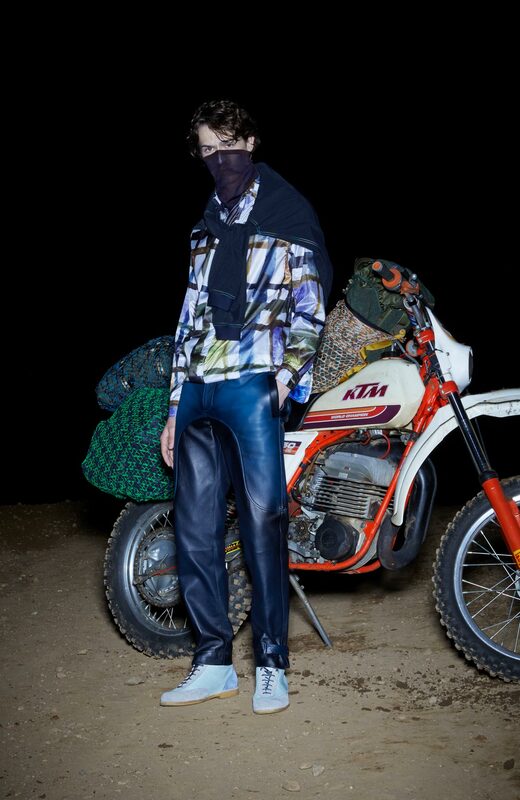 Here the rider of the motorbike is in the desert now, so everything has become really soft-toned, all our fabrics have been washed, and our leathers have been hand-sprayed in order to give that used feeling. Then because this is a hard journey with changes of terrain and climate, we’ve got lots of technical fabrics as well. There’s a shower-proof nylon, with a pattern that first of all was hand-painted, then scanned really large, then digitally printed. Then we’ve got this ripstop fabric as well that’s actually breathable – ripstop nylon – but it doesn’t allow sand to get through. It’s been stitched with our iconic space-dye yarn. There’s an emphasis on mid layers – pieces that can be put on or taken off as the journey progresses and the temperature changes – things in a viscose and a cotton crepe that sit close to the body and are comfortable and quite elongated. These are super breathable and super light as well. Really light and fluid. 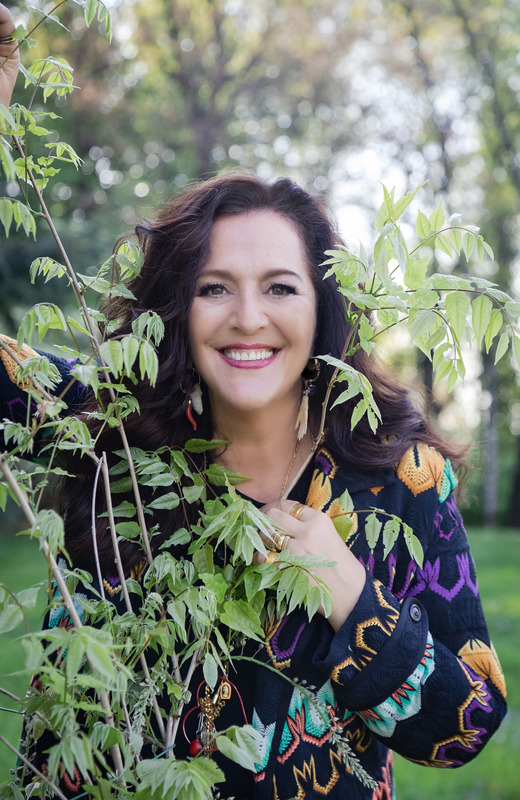 As Missoni is known worldwide to be a knitwear house, it can be a little difficult sometimes for us in the summer as people think of us as being a bit woolly and weighty. 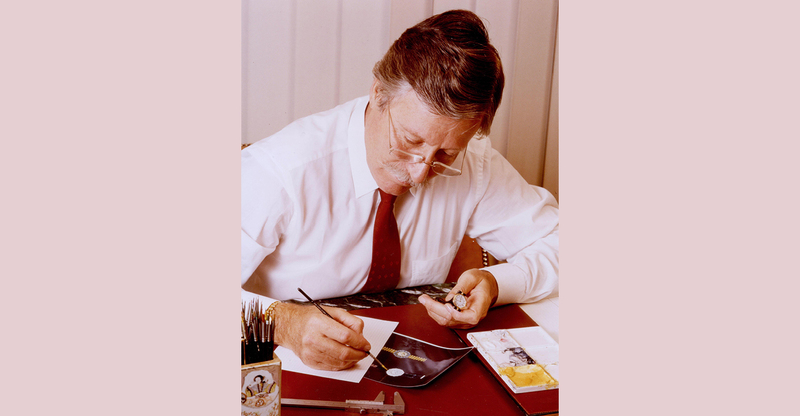 So here we’ve tried to really show that knitwear can be great in the spring and summer too – we’ve played a lot with the weight of the fabrics, with what we call these “intimate” weights. We’ve used lightweight knits to create jacquards that look like racing flags, and we’ve also got these really fluid, slinky viscose pieces that have been printed with a tyre-track print. And then there are large pyjama shapes, which I like. They are great for warm-weather wear, really fluid; I think they are really quite fabulous. The intimate layers are almost like underwear pieces. There are many T-shirts and fluid polo shirts, and these have been inspired by the racing flag too. There are also ethnic prints, and jacquards that have been inspired by carpets from West Africa. The other thing we have tried to do is work with a colour palette that will appeal to men, inspired by the desert – lots of yellows and oranges; we’ve gone quite earthy with the tones. 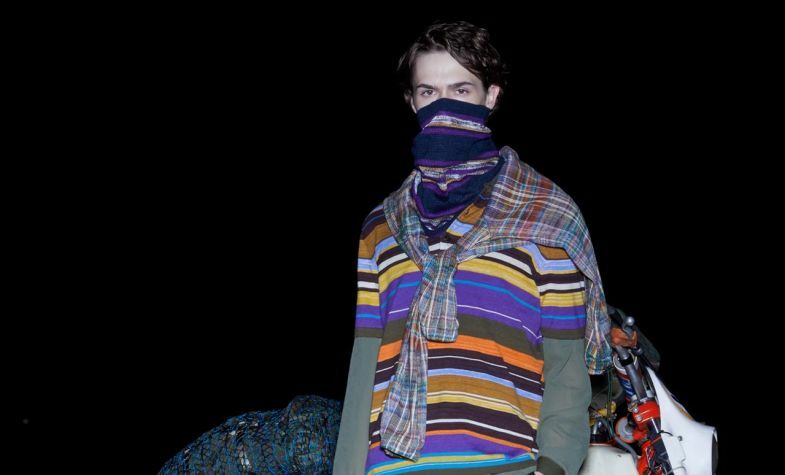 I think men in general can be quite scared to wear colour, so we have to do it with balance: Missoni’s DNA is knitted patterns and colours, but we need to make sure it’s not scary for someone to wear. So, for example, if these colours were combined together with a space dye, they’d look like a strong graphic stripe, so instead we have worked them so they look super soft. One of my favourite looks of the collection is a quintessentially Missoni blue knit suit, which is a double-breasted tailored piece. 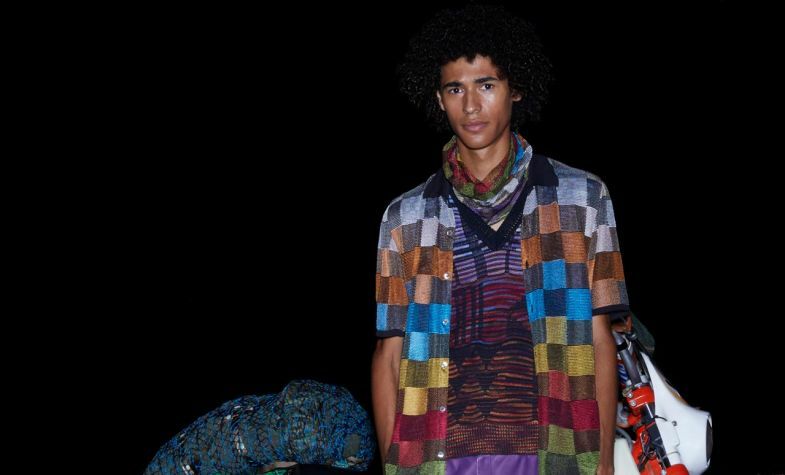 It’s relaxed and unstructured, in true Missoni style, and we have imagined it together with our underwear-like theme, with a really gauze-y polo shirt, so it’s not a bulky look at all. Another great “intimate piece” is a viscose and cotton crepe pullover, which is both slinky and dry to the hand at the same time. The blue suit is a great example of what we can do. A lot of our soft tailoring is made on our knitwear looms. These are looms that are exclusively at Missoni, a cross between a loom and a knit machine, so it gives you the opportunity to have a warp and a weft, so you can make a compact fabric: we are able to create trousers and jackets, but they are as stretchy as a jumper. So when you’re wearing a Missoni double-breasted blazer, it’s actually as light and tactile as a cardigan. You can ride mopeds and motorbikes wearing this sort of thing and still look sharp, not creased. 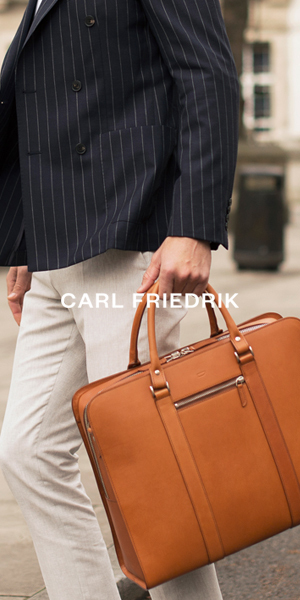 Or you can put it in a suitcase or just throw it in a bag and then wear it straight away, as it’s creaseproof.